We welcome you to our church and our web site! 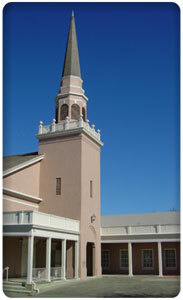 We hold worship services every Sunday and Wednesday. On Sundays we have Bible Lesson Quarterlies in Spanish for Spanish speakers to follow the service. Child care is provided at all our services. All are welcome to attend! Sunday Worship Services 10:00 – 11:00 a.m.
Sunday School 10:00 – 11:00 a.m.
Wednesday Testimony Meetings 7:30-8:30 p.m.
Sunday Worship Services 10:00 – 11:00 a.m. Tenemos los Cuadernos Trimestrales de la Ciencia Cristiana para las Lecciones Bíblicas en español para los miembros que se habla español e invitados a seguir el servicio. Sunday School: 10:00 – 11:00 a.m.
Wednesday Testimony Meetings: 7:30 – 8:30 p.m.
Click here for driving directions to our church. Haga clic aquí para ver cómo llegar a nuestra iglesia.